As part of our efforts at sharing stories and creating healing circles, we are launching blog circles here at TAN. Each month we will post a brief message introducing the theme for the month, and inviting you to participate in the circle. All you need to do is put your name and link into the Mr Linky widget at the end of this post, and your blog post can be included in the circle. Posts are welcomed throughout the month (and beyond if you write something later and want to share). We hope you will participate! The theme of the December Blog Circle is Holidays After Loss. To participate in the blog circle, I immediately looked up an old blog post from the Christmas season in 2009. I experienced my first miscarriage in early November and so when I hit the holidays that year, my loss was very fresh and raw and I remember countless moments of sitting with family members having “happy” celebrations and feeling at the desperate edge of tears the entire time, but trying to be good spirited for my other kids and also not “ruin” the holidays for everyone else. Today, I would have been 21 weeks pregnant and it has been a hard day for me. Our family has a tradition of having a winter solstice party each year. We host at our house (my mom then hosts Christmas) and it is a nice time. We use the occasion to reflect on the past year and the things we’ve accomplished and then set goals for the year to come—things we’d like to “bring into the light” as it were. We also give our immediate family gifts to each other on this day. Anyway, I just really missed the baby today and also missed the pregnant-self. I felt really strongly how I would have been really looking pregnant by now and the baby would have been making himself well-known to others around me with kicks and rolls and so forth. I can’t describe it in words, I just really FELT it today. The non. The closed door. The two boys instead of three. It started when I opened up my set of Growing Uterus charts and The Birth Atlas from Childbirth Connection. I’ve always wanted them and I ordered them a couple of months ago when they had a wonderful deal. When they arrived, I had Mark put them away for Christmas. I didn’t think it would bother me to open them. 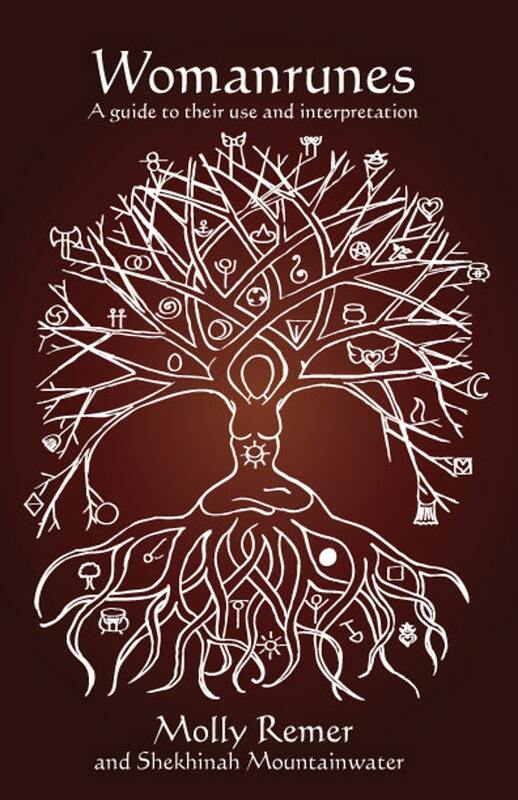 I am still interested in birth, birthwork, and childbirth education. I’ve been reading other birth books and not having any “issues” with them, but opening the charts and seeing the point at which my own pregnancy and baby and hopes and dreams and plans arrested, was really difficult. The “cut off”/stopped/ended road point was right there in black and white and I had a strong and unexpected reaction to that. Later in the afternoon we went outside to go for a walk and also to place Noah’s memorial plaque. Standing there looking at it, I just MISSED him. And, I missed the experience of “would’ve” been 21 weeks pregnant–with my hand on my full belly, feeling my baby from within and outside, and having that communion and connection with him. I felt at the edge of tears for most of the rest of the day and just “down” and distressed feeling. I thought it would help me to write about it, but I’m not finding the words easily. I can’t explain or describe what it was I felt today. 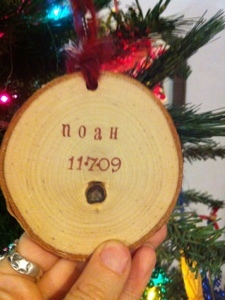 That year, I bought a special ornament for our tree with Noah’s name and birthdate and also the words, Born at Home. 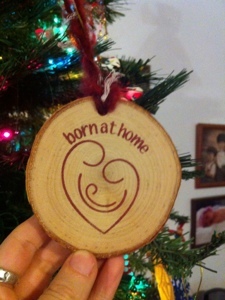 As I’ve shared several times, it is very important to me to have miscarriages acknowledged as birth events and it really, really mattered to me to have a homebirth specific ornament to recognize my baby. 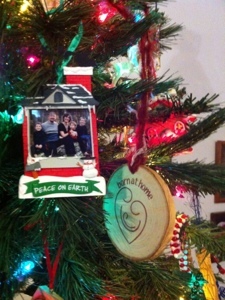 This year, it hangs on the tree next to our new family ornament for 2012. In 2010, when I got maternity photos taken, I made sure to include Noah’s angel bear in several of the photos to acknowledge his presence and place as a member of the family. And again, in 2011, I also included the bear in a photo session with me and the kiddos. This year when we got our family pictures taken, I made sure to wear my baby-in-my-heart pendant, so that Noah, still, was there with us in the pictures as part of our family. In September, my friend’s baby Tossie died at 36 weeks. To honor Tossie’s memory, she’s started a blog to help other loss mamas: Tossie’s Tree & Painted Rocks. One of the first rocks she painted was for my own little Noah. She took a picture of it at sunrise by her own baby’s special tree and it is lovely! Michele–Holidays After Loss (this post was especially good, very poignant, and from it I went to a variety of other interesting posts on her blog. Michele also runs Mending Hearts Bellies which focuses on childbirth education and doula support for post-loss families). ← Taking it to the body… Part 2: Embodied mindfulness, introversion, and two hours! Thanks for sharing this. Will post a contribution to the blog circle tomorrow.